The SCAD Museum of Art presents an exhibition by Lorraine O'Grady, which brings together two major works in the artist's oeuvre. From Me to Them to Me Again showcases her single-channel video Landscape (Western Hemisphere) and a new series of haiku diptychs created by radically selecting and recombining individual panels from her earlier series of newspaper poems Cutting Out the New York Times, to achieve a totally new work in intellectual intention and aesthetic scope, published in 2017 as the large-scale editioned prints of her new series Cutting Out CONYT. The title of the exhibition references O'Grady's concern with the cyclical, interrogative way she revisits her own work in ongoing efforts to unlock new meaning and examine the relationship between the artist, her output, art institutions and the public. Text and language feature strongly in O'Grady's evolution from a young intelligence analyst for the departments of Labor and State during the Cuban Missile Crisis in 1962, to her careers in teaching, writing and artmaking. In her series Cutting Out CONYT, she observed that she embarked on the project "as a writer and ended it as an artist." 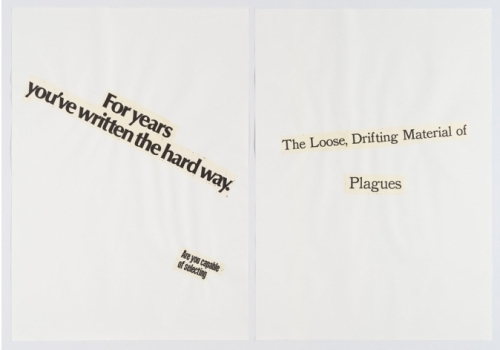 To create the original series, O'Grady manipulated headings, words and phrases from The New York Times over 26 consecutive Sundays to create new poetic assemblages that reference Dada, Surrealism and concrete poetry. However, unlike the embrace of the irrational by the Dadas (whose work she was teaching at the time at the School of Visual Arts in New York), O'Grady strived for new meaning. Equally important in the later, more fully imagined series, Cutting Out CONYT, is the diptych as form, which brings two elements together to create a ceaseless exchange. Conceptually for O'Grady, the diptych is a device for critique, where "there's no being saved, no before and after, no either/or; it's both/and, at the same time. With no resolution, you just have to stand there and deal." Landscape (Western Hemisphere) is a richly textured, black-and-white in color film that closely traces the artist's hair moving and shifting, and is set to a changing, subtle soundscape of the outside world. The film is a metaphoric, contemplative work, which invokes more than it describes or prescribes. The geographical reference of the title contrasts the vastness of the land summoned and the intimacy and closeness of the camera to the artist's person. The camera is not neutral – it records, keeps what it sees, and is, therefore, a stratagem that allows for analysis and classification. O'Grady invites the viewer to search for clues within this abstracted closeup of her body. The installation of From Me to Them to Me Again has been calibrated, like the diptych form itself, to create tensions and relationships between two distinct works in different genres produced more than two decades apart. They form bookends within the artist's oeuvre: separate, but related and dependent on each other. The structure of the diptych is a frequent motif in O'Grady's work and allows her to question apparent oppositions between her apparently different voice while maintaining their productive tensions. Siting her work in the interstitial space between personal and political, inner and outer, post-black and black, for O'Grady the two unusually beautiful works on exhibit here also bring into play her nuanced considerations of identity and the specter of race in the present. She has sometimes described herself as having been 'post-black' before she was 'black,' but more often considers blackness and post-blackness as oscillating states. Cutting Out CONYT and Landscape (Western Hemisphere) explore the shifts between these two states and many other shifts, in an attempt to undermine the predications of the artworld and its attendant value systems, in addition to those of the larger world.